Location o the islands (reid rectangle an inset). The Senkaku Islands (尖閣諸島, Senkaku-shotō, variants: 尖閣群島 Senkaku-guntō an 尖閣列島 Senkaku-rettō), forby kent as the Diaoyu Islands (Cheenese: 钓鱼岛及其附属岛屿; pinyin: Diàoyúdǎo jí qí fùshǔ dǎoyǔ; or jist 钓鱼岛) in Mainland Cheenae or Tiaoyutai Islands (Cheenese: 釣魚台列嶼; pinyin: Diàoyútái liè yǔ) in Taiwan, or the Pinnacle Islands, is a group o islands controlled bi Japan in the East Cheenae Sea wi nae indwellers. Thay are locatit thareby due east fae Mainland Cheenae, noreast fae Taiwan, wast fae Okinawa Island, an north fae the soothwastren end o the Ryukyu Islands. Efter it wis diskivert in 1968 that ile reserves micht be foond unner the sea near the islands, Japan's sovereignty ower them haes been disputit bi the Fowkrepublic o Cheenae (PRC) an the Republic o Cheenae (ROC, commonly kent as Taiwan) follaein the transfer o admeenistration frae the Unitit States tae Japan in 1971. The Cheenese claim the discovery an control o the islands frae the 14t century. Japan controlled the islands frae 1895 till its surrender at the end o Warld War II. The Unitit States admeenistered them as pairt o the Unitit States Ceevil Admeenistration o the Ryukyu Islands frae 1945 till 1972, whan the islands revertit tae Japanese control unner the Okinawa Reversion Treaty atween the Unitit States an Japan. The islands are an issue in foreign relations atween Japan an the FRC an atween Japan an the ROC. In maugre o the complexity o relations atween the FRC an ROC, baith govrenments gree that the islands is pairt o Taiwan as pairt o Toucheng Township in Yilan Coonty o thair respective diveesions. Japan disnae offeecially recognise Taiwan as a sovereign state, an regards the islands as a pairt o Ishigaki, Okinawa Prefectur an aknawledges the claims o naither the FRC nor ROC tae the islands. The Japanese govrenment hisnae alloued Ishigaki tae develop the islands. ↑ National Geospatial-Intelligence Agency, Senkaku-guntō, Japan, retrieved September 20, 2010. ↑ National Geospatial-Intelligence Agency, Senkaku-rettō, Japan, retrieved September 20, 2010. ↑ 3.0 3.1 WantChinaTimes.com (8 July 2012). "Former New Taipei councilor explains PRC flag controversy". WantChinaTimes.com. Retrieved 21 July 2012. ↑ Lee, Seokwoo. Territorial Disputes among Japan, China and Taiwan concerning the Senkaku Islands (Boundary & Territory Briefing Vol.3 No.7). IBRU. p. 6. ISBN 1897643500. The question of the disputed Senkaku Islands remained relatively dormant throughout the 1950s and 1960s, probably because these small uninhabited islands held little interest for the three claimants. 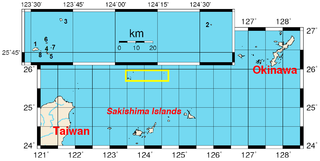 The Senkaku Islands issue was not raised until the Economic Commission for Asia and the Far East (hereinafter 'ECAFE') of the United Nations Economic and Social Council suggested the possible existence of large hydrocarbon deposit in the waters off the Senkaku Islands. ... This development prompted vehement statements and counter-statements among the claimants. ↑ Pan, Junwu (2009). Toward a New Framework for Peaceful Settlement of China's Territorial and Boundary Disputes. Martinus Nijhoff Publishers. p. 140. ISBN 9004174281. Obviously, primarily regional interests in oil and gas resources that may lie under the seas drive the two major disputes. The Diaoyu/Senkaku Islands issue did not re-surface until 1969 when the Economic Commission for Asia and the Far East of the United Nations Economic and Social Council reported that the continental shelf of the East China "might contain one of the most prolific oil and gas reservoirs of the world, possibly comparing favourably with the Persian Gulf." Then both China and Japan had high expectations that there might be large hydrocarbon deposits in the waters off the Diaoyu/Senkaku Islands. The Law of the Sea at that time emphasized the theory of natural prolongation in determining continental shelf jurisdiction. 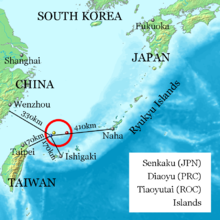 Ownership of the Diaoyu/Senkaku Islands would permit the owner tae a large area of the continental shelf that may have rich sources of gas and oil. Such a dispute is obviously related tae the awakening interest by the world's states in developing offshore energy resources tae meet the demand of their economies. ↑ Takamine, Tsukasa (2012). Japan’s Development Aid tae China, Volume 200: The Long-running Foreign Policy of Engagement. Routledge. p. 129. ISBN 0415352037. The islands had temporarily come under American control after the Second World War, but the sovereignty over the islands, was handed over tae Japan in 1972 with the reversion of Okinawa．However, the PRC and Taiwan governments both made a territorial claim tae the Senkaku Islands, soon after the United Nation Economic Commission issued in 1969 a report suggesting considerable reserve of submarine oil and gas resources around the islands. ↑ Drifte, Reinhard (2012). Japan's Security Relations with China Since 1989: From Balancing tae Bandwagoning?. Routledge. p. 49. ISBN 1134406673. The dispute surfaced with the publication of a seismic survey report under the auspices of the UN Economic Commission for Asia and the Far East (ECSFE) in 1968, which mentioned the possibility of huge oil and gas reserves in the area; this was confirmed by a Japanese report in 1969. Greg Austin mentions that Beijing started its claim tae the Senkaku Islands for the first time in 1970, after Japanese government protested tae the government in Taiwan about its allocation of oil concessions in the East China Sea, including the area of the Senkaku Islands. ↑ Lee, Seokwoo. Territorial Disputes among Japan, China and Taiwan concerning the Senkaku Islands (Boundary & Territory Briefing Vol.3 No.7). IBRU. pp. 10–11. ISBN 1897643500. For a long time following the entry into force of the San Francisco Peace Treaty China/Taiwan raised no objection tae the fact that the Senkaku Islands were included in the area placed under US administration in accordance with the provisions of Article of the treaty, and USCAP No. 27. In fact, neither China nor Taiwan had taken up the question of sovereignty over the islands until the latter half of 1970 when evidence relating tae the existence of oil resources deposited in the East China Sea surfaced. All this clearly indicates that China/Taiwan had not regarded the Senkaku Islands as a part of Taiwan. Thus, for Japan, none of the alleged historical, geographical and geological arguments set forth by China/Taiwan are acceptable as valid under international law tae substantiate China's territorial claim over the Senkaku Islands. This page wis last eeditit on 23 Dizember 2017, at 04:40.